Accepting house: An accepting house was a primarily British institution which specialised in the acceptance and guarantee of bills of exchange thereby facilitating the lending of money. They took on other functions as the use of bills declined, returning to their original wider function of merchant banking. 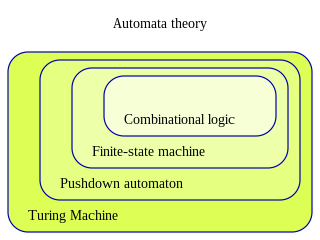 Finite-state machine: A finite-state machine or finite-state automaton (FSA, plural: automata), finite automaton, or simply a state machine, is a mathematical model of computation. It is an abstract machine that can be in exactly one of a finite number of states at any given time. Acceptance of responsibility: Acceptance of responsibility is a provision in the United States Federal Sentencing Guidelines providing for a decrease by 2 or 3 levels in offenders' offense level for admitting guilt and otherwise demonstrating behavior consistent with acceptance of responsibility, such as ending criminal conduct and associations. It amounts to a sentence reduction of about 35%.